Why buy shoes & clothing from 6PM USA online store? If you are looking for shoes of all styles and brands at an affordable price, 6pm is just the site for you. Offering men, women and children shoes, 6pm is the best place to go when searching for the perfect shoe for you or your loved one. Each day, 6PM offers big one-day sales for a few items at surprisingly low prices.Don't hesitate to place the order if you have found some pair of shoes you like, since you probably will not find it on sale the next day! With 6PM, there is no worry about buying fake or defect products, since all the items on sale are genuine and authentic. But these items' prices are heavily discounted for they in most cases are discontinued products or clearance items. 6PM offers free shipping for all orders and 6PM does not have international delivery for customers outside USA. They offer expedited shipping, for a minimal fee, to those who need their items quicker than others. Delivering your product via USPS or UPS, 6pm guarantees accurate and efficient shipping on all of their products. When shopping at 6pm, customers can get overwhelmed with all of the choices that they have to offer. Lucky for you, they have easy navigational search functions that can help direct you to exactly what you are looking for. From heels and pumps to tennis shoes and flip-flops, 6pm has it all. How USGoBuy can help with international customers' shopping at 6PM? USGoBuy gives you a US shipping address for free, so you can have free shipping from 6PM and buy at American cheap prices. 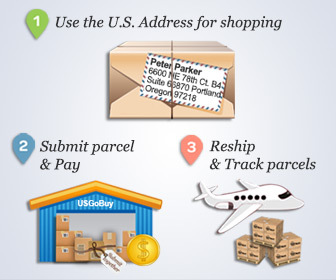 Once your 6PM purchases arrive at USGoBuy warehouse, you have 2 options: either ask USGoBuy to ship out the packages to your international address or ask USGoBuy to consolidate your 6PM parcel with other US purchases to save your shipping fee. Submit shipping request to USGoBuy, pay the heavily discounted shipping fee and all you have to do is wait for your parcels at home! Don't forget the repacking & consolidation services are for free! Register and get Free USA mailing address here! Start your online shopping at 6PM now!